Model#: 9070. Notice of sizing issue with style 9070 This water-resistant, full grain leather clog is constructed with our shock-absorbing SFC Mighty Grip outsole. This ergonomic design features a 1 ¼" rubber heel. Shoes For Crews Women's Quincy Slip Resistant Casual Shoes Black Size 8M. Shipped with USPS Priority Mail. Crews For Shoes Low Rider IV Womens Size 9 Slip Resistant Work Shoes . Condition is Pre-owned with no major flaws or issues. The black on black color scheme is super sharp and looks great on. They would be perfect for line work special occasions or casual wear. Original retail was not cheap but get yours here at a great price. Please ask questions if you have them before bidding and check out my eBay store. Shipped with USPS free Priority Mail. Shoes For Crews Size 8 Black Womens Used Shoes. Condition is Pre-owned. Shipped with USPS Priority Mail. NonSlip Shoes for Crews Work Safety Sneakers Marathon Black Size 5.5. Shoes for Crews. Running-inspired with oversized cushioning. Slip resistant. Weight (per shoe): 12.2 oz. Model: Proclassic III. Model#: 7001. Shoes For Crews. Material: Leather. We take great pride in providing you with high quality and value. Color: Black. Slip resistant. Oil resistant. Black leather. ITEM: Shoes for Crews Falcon II Black Leather Slip/Oil Resistant Sneaker. COLOR: Black. CONDITION: VERY NICE! Gently used with very little signs of wear. Soles and insoles show light wear. See Pictures! Shoes for Crews 36167 Style Women's Slip Resistant Shoe Size: 4 US / 1 UK / 33 EU / 21.0 CM Color: Black Style: 36167 Style Code: AL06-09/17 Condition: New with Tags and Cleaning Tool Original Box Not Included. I ship same day if payment is made before 11am EST otherwise first thing next AM. Shipping is FREE. Check my feedback and bid with confidence. Thanks for looking. Please see photos for an accurate description of item and condition. Brand new without box SFC Shoes for Crews Top Crews Black Leather Clogs Sz 6 Black genuine leather upper Padded removable in-sole Durable rubber “Mighty Grip” slip and oil resistant outsole 2.25” Heel height Water resistant Please refer to pictures and ask any questions as I don't accept returns. These shoes are "new without the box". They were tried on but worn. There is a light scuff on the toe of the shoes. 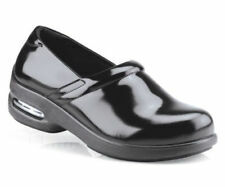 Really great black leather slip on loafers with cushiony beds.slip & oil resistant.2" heel. Shoes are pre owned in good conditions, see pictures for details. 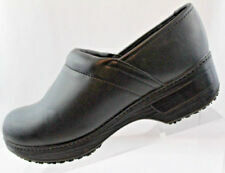 Shoes For Crews Womens 7.5 Black Clogs Anti Slip Work . Brand new never worn size 7 1/2women’s no box message me for details Shipped with USPS Priority Mail. Size 6 Non-Slip Work Shoes. Excellent - Only slight signs of wear. Does not diminish the overall appearance of the item. 1.5" wedge heel with 1/2" platform. Slip & oil resistant. Good - Shows signs of regular use. Item shows visible wear. Excellent for hospital, housekeeping, restaurant because it’s non skid anti slip sole resistance. S ee pictures for details. Not brand new but fair condition, still have a lot of work life left to do. Little tearing on inside sole as pictured but won’t affect your feet. Black, slip resistant shoe. 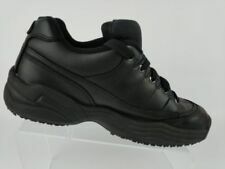 Shoes For Crews Women Liberty Slip Resistant Food/Service/Work Sneaker Black 8w Condition is New with box. Shipped with USPS Parcel Select Ground. My goal is to provide you with a great buying experience. If for any reason you are not. 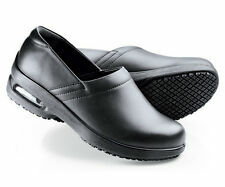 SHOES For CREWS Womens 8.5 Non-Slip Comfort Work Shoes Black. Condition is New with box. Shipped with USPS Priority Mail. Fastening: Slip On. Heel Type: Wedge. Materials: Leather Uppers, man made balance. Uppers - have scratches and creases, Stitching on Left Shoe has wear. Pattern: Solid. Color: Black. ANY QUESTIONS PLEASE FEEL FREE TO CONTACT US KILLER SHOES!!! PLEASE TAKE A GOOD LOOK AT THE PICTURES THEY ARE PART OF THE DESCRIPTION. GOOD PRE-OWNED CONDITION!!! Slip on loafers. Square toe. One small tread square is missing on back of left heel. Light creasing across top of left shoe where foot/toe bend. Slip and oil resistent. Work, safety shoes. One scuff on right inside ball/toe (see photo). Black leather upper with apron toe, extended neck and little moccasin-stitched detailing on sides. These seem to be a nice roomy 10. Shoes for Crews Work Safety Sneakers Liberty Black Women's Size 5 #37255 . Condition is New with box. Shipped with USPS Parcel Select Ground. COMFORT FIT - Relaxed-fit for more spacious feel surrounding foot. · Weight (per shoe): 11.2 oz. · Stretch gore on sides for step-in comfort. · Leather upper on infused EVA midsole. · Slip resistant.